To say the least, we were blown away by the talent that surrounded us in a room of entrepreneurs at the Delta College Planetarium last night. The group may have appeared small in numbers to some, but the ideas, motivation, and heart was larger than life. First, we have to start by saying a big THANK YOU to Patrick from the SBDC Great Lakes Bay Region for a relevant and actionable presentation about how to start your very own small business. Patrick started by giving us all some important things to think about when taking your business idea from 'inspiration to reality.' Then we got into the nitty gritty of legalities, paperwork, and costs associated with making your business legit and learned A LOT. Toward the beginning of his presentation, Patrick asked each person in the room to introduce themselves, their business or business idea, and tell a bit about what they hoped to get out of this session. No two people in the room were exactly the same. Each person was at a different stage in the process; whether that be getting ideas down on paper, on the cusp of legitimizing their business, and even a few that have been at it for a bit looking for advice and affirmation. We absolutely loved seeing everyone from different backgrounds with different goals come together and learn - an awesome evening for sure! One of our biggest takeaways from the night was how much networking can benefit and impact you and your business. Don't be afraid to share your ideas with others' and bask in the knowledge, conversations, and connections that the simple act of talking can bring your way. Networking and collaboration is what has driven us to put these sessions together for you! Will we see you at our next session on February 1st on the topic of Taxes & Accounting? RSVP HERE! Photo from Sarah at Angeline Kay Art + Design. We are so excited to tell you all about Jordyn Carmien the creative behind Jordyn Alison Designs today on the blog! She is Bay City born and raised; attending school at Western, John Glenn, Delta and now Saginaw Valley State University where she is studying for her degree in Graphic Design. Jordyn says she has always been into drawing and creativity, especially in the summer time thanks to her dad. Card making is something she initially started doing for family and friends simply because she enjoyed it. When she met her boyfriend, she started taking things a bit more seriously and opened her Etsy shop, which today offers 100+ items (WOW)! Then when he joined the Air Force, she became even more serious about making this fun-venture into a business-venture and started focusing on LDR cards, which are hard to come by! She recalls, "I will never forget the feeling of getting two 10 card orders the weekend he left for boot camp, it was almost as if it was a sign that I'm doing the right thing." Jordyn felt there was nothing more unique than her name, which is now Jordyn Alison (her first and middle name) Designs came to be! Her favorite part of her creative small business is the number opportunities to meet new people that it brings. Although she's a self-proclaimed-introvert, she says all of the practice has paid off and made her confident and proud of the products that she makes and she loves talking to people at her craft shows! Jordyn especially enjoys connecting with others' also involved in LDR's and getting to share their stories with one another, "knowing those cards mean so much more to them is very rewarding." Besides her LDR cards, her 'Smart Cookie' card has been a fan favorite too! When Jordyn isn't being creative she gets excited about traveling and exploring new places. Jordyn Alison Designs has been part of our shop since the beginning, and we have loved seeing all of the fun designs of cards she continues to bring in month after month. For now, this is a part-time job for her while in college, but after graduation she hopes to be doing this full-time! You can find Jordyn Alison Designs by clicking the button below or stopping into Half Mile Handmade! December Meet the Maker Featuring Real Simple Candle Co.
Emily Collins is the creative behind the hand poured soy candles at Real Simple Candle Co. A Michigan girl, through and through; Emily grew up in Rochester Hills, attended college at Michigan Tech and now resides in Battle Creek, MI. Her academic and professional background are highly scientific but she has always made it a point to balance that side of her life with an equally creative side. Emily has been making things throughout her life, starting with kitting and crocheting. She has also dabbled in photography, graphic design, wool dying and spinning. It's neat to see how these experiences have culminated into her running her own creative small business! Lots of trial and error led to the perfection that is Real Simple Candle Co. which opened its doors for business on Etsy in June of 2016. The name of her business truly embodies the vision and purpose of her products. Emily did not want dyes, busy designs, or extravagant fragrances in her candle line, "I wanted someone to look at a picture of that candle and already know what it's going to be like when it shows up at their door," she says. We are so lucky to have stumbled upon Emily and her candles on Instagram shortly after we opened - these fun scents have definitely been a fan favorite at the shop! Emily says it's hard to pick a favorite part in the process of making her candles, "pouring hot, delicious wax is amazingly satisfying," she also enjoys buying and testing out new fragrances and designing the packaging. At the moment, Real Simple Candle Co. is Emily's side hustle, she works full-time for an engineering company, but hopes one day to focus entirely on her small biz. You can find Real Simple Candle Co. online by clicking the button below or stopping in to Half Mile Handmade! Kirsten McIlvenna is the creative behind the eco-friendly and unique pieces at Delirious Blue Jewelry! She has spent time in places all over Michigan, and after graduating from Saginaw State University found the first place that felt like home right here in Bay City! Kirsten now lives and works in Kalamazoo, MI but visits Bay City as often as she can. Kirsten grew up creating, and for a while she says it seemed like she would pick up a new hobby almost every year. Then in 2012 when she tried making jewelry, it stuck! Only four short months into her jewelry making adventure she opened her Etsy shop. She recalls that her first sale ever was a pair of bottle cap earrings for $4. Since then, she has put more time, effort, and focus into her small business and now offers over 50 different one-of-a-kind and environmentally conscious pieces in her shop. We just love the story of where the name of her business comes from too! So much so, that we are just going to quote her story verbatim... "In high school I played French horn in the concert band. During my junior year, we played a song called "Where Never Lark Nor Eagle Flew" which was inspired by the poem "High Flight." Beyond it being a beautiful song that I continued to listen to via my iPod, in it was the most beautiful horn solo, which I got to play. It was the first time I was truly proud of my abilities in playing. At the concert, I heard the poem read for the first time, and I loved it as well. Delirious Blue comes from part of the poem:"
Kirsten is another maker that has been with us since the day we opened, and I am very lucky to be able to call her a personal friend as well. Her absolute favorite part of the process is actual creation, "it's that moment when we imagine a new idea and then get to play and experiment and see it come to life." Speaking of, we are pretty excited to see how this Bay City skyline cuff bracelet turns out! Kirsten works full time as the Communications Director for the non-profit, International Child Care. She also takes classes at the Kalamazoo Institute of Arts to develop her skills as a metal smith and is currently in her third semester. Go see Kirsten in person at Kalamazoo Vintage Market, or click below to get your Delirious Blue Jewelry pieces online. I'm willing to bet that you can find the perfect gift for everyone on your list by shopping handmade this holiday season! We are definitely here to help you with that, but beyond our brick and mortar shop (that is open 6 days a week, and has hundreds of handmade items to choose from) there are plenty of craft shows to attend and find the perfect gift! I've asked some of our makers to share their upcoming shows with me and am making one gigantic shopping list to share with all of you! Hopefully, at least one of these is in your area! If it's been a while since you've been to a craft show/bazaar, now is the time to check one out. There are SO many talented and creative makers there are out there - I guarantee you won't leave empty handed! We've also put together a shoppers guide to help you prepare for the handmade craft show shopping experience. Do you have a show we should add to the line up here? Send us the details at hello@halfmilehandmade.com and we'll add it immediately! Shop til you drop! P.S If you're a maker and want to promote your shows FOR FREE we've got a list of tips for you here. Erin Bonham is the creative behind the greeting cards at BoxBerry! She grew up in Gladwin, Michigan, attended college at Ferris State University, and now lives in Chicago, Illinois. Memories and moments from her past have played a big part in how she got started making greeting cards - she says, "I've been a lifelong doodler so the illustrations came easy. Like most girls of the 90's I had an obsession for the wildly colorful stationery products of Lisa Frank. As a kid, I loved going through my mother's writing desk that always seemed to be stocked with whimsical stationery, stamps, and greeting cards." In 2013, she started creating cards to send to her pen pals and sold them on Etsy as well as local shops and craft shows. Initially, she offered about eight designs, and now has upwards of 40 available. The name of her business actually comes from a plant, the Boxberry (aka Teaberry). Erin explains, "growing up, I was lucky enough to live next door to my grandmother who had a couple teaberry plants in her yard. Around age 5, she introduced me to the plant and its minty edible berries so naturally I assumed this was a magical plant that only grew at her home. I loved that feeling I got when I went searching for the tea berries so I wanted my card line to represent that same feeling." Bonus fun fact, Erin actually has a Boxberry plant tattooed on her arm! Erin has been with us from the very beginning of our shop and even donated an item to the ultimate-handmade-giveaway at our grand opening; it has truly been a pleasure working with her. Illustration is Erin's favorite part of her creative process. She says her second favorite thing is printing the card and actually seeing the final product for the first time. (We bet that does feel amazing!) In addition to her creative small business, Erin is a freelance graphic designer. Go see Erin in person at One of a Kind Show & Sale December 1-4 in Chicago, or click the link below to get your BoxBerry goods online! Craft shows are no joke! Are you ready to shop handmade? There are a handful of simple things you should consider bringing with you to craft shows to be completely prepared for a great day of shopping. 1) Cash. Although most makers have a Square or other method for collecting credit card payments, not all of them have that technology available. Take cash with you to guarantee that you'll be able to actually purchase any item that catches your eye. (HINT for makers, if you don't have a Square and you want one, sign up here and we can both get some fee-free processing. P.S. It's FREE to get a card reader). 2) Reusable bag(s). It's far easier to carry 1-2 large bags full of goodies than a number of smaller bags from the various makers you purchase from. You'll thank yourself for this one! 4) Snacks & water. If you're planning to make a day of it, make sure to take some nourishment! Many shows will also plan to have a food truck or other source of food present, but in the event that they do not, you'll definitely want to have your own fuel to keep you in the shopping zone! Yes, etiquette! Make sure that you, your partners-in-shopping-crime, and any little ones are on their best behavior when you go to craft shows! Don't barter. A PSA from our friend Danielle at The Little Things, backed by us! If you didn't go to business school, then you may not know there is a steadfast formula for pricing goods and services; an even more complicated formula for those that are tasked with pricing their own handmade goods. The prices are what they are for a reason, please don't try to offer less or try to finagle a "two-for" deal. Keep the 'I could make that' comments to yourself. It will literally cost you $92 worth of supplies, plus time, and probably 3-4 complete fails before you get it right. Take my advice, this breaks makers hearts, plain and simple don't do it. Ask to take photos. A tip from Andrea at 614 Knit Studio! Sometimes you need a second opinion before you take the plunge and purchase something, and makers get that. Chances are they are going to let you photograph an item, but please do them the courtesy of asking first! Take and post a photo of your haul. One thing that makes the hearts of creatives across the land happiest is seeing their products in use, in their new home, or just included in a collection of other handmade items you got at the show. Make sure to tag them in the photo so they actually see it. (HINT, if you have a private profile, send a direct message to the maker of the photo you took/posted otherwise they won't be able to see it even if you have tagged them). My haul from the Craftin' Outlaws Spring 2016 Show featuring Kill Taupe, Logan Schmitt Illustration, and Jodi Lynn Doodles. Do you have any "must takes" when you head to shop at a craft show? Leave your suggestions in the comments! Thank you all for taking the time out of your day to share your thoughts and ideas, I appreciate you! IT’S THE MOST WONDERFUL TIME OF THE YEAR! Okay, not *quite* but it’s going to be here before we know it – the holidays! For those with creative small businesses, this is often the busiest and most stressful yet rewarding time of the year. It’s always a good idea to start gearing up as soon as possible (easier said than done, I know). Today, I’m sharing some of my favorite ways to promote your holiday craft shows to get you in the spirit! These methods are free, easy, and don’t take too much time so you can get back to making allllllll that inventory - let’s get to it! If you sell on Etsy you can utilize Etsy Local, which is a resource for customers looking to purchase handmade items in person rather than online (or maybe both). Type “Etsy Local” into your favorite search engine, or click here. Put the location of your show in the search bar and see if it comes up. If it does, all you have to do is click on the event name and then click the "I'm participating" button. You'll have 140 characters to give people a little preview of what you'll be bringing to the show. If you don’t see your event listed I would recommend contacting the organizer of the show to create the event rather than taking it upon yourself to do it. The organizer will have all of the information such as date, time, address, and event details, plus they will be able to notify the other show vendors that the Etsy Local event has been created. Once you've added your shop info, your shop will show up when people look at Etsy Local for shows in their area and it will show up on your shop under the "Local" tab. Before I get into social media, it’s worth mentioning that you’ll more than likely have to do a lot of the work from a computer of some sort. I typically can’t do most of these actions on behalf of my business page from the Facebook app on my phone, so I do get on my desktop or laptop for most of this. For Facebook, if you have a business page you can add the event to your page. Find the event for the show on Facebook, and then click the "..." button located in the upper right corner underneath the event cover photo and select "Add to Page..." Another window will pop up asking which page you'd like to add it to, just make sure you pick your business page! Now, when fans visit your Facebook page this will appear under your Events tab. Some creatives make an entirely separate event for their specific brand too and add it to their page the same way. For Example, I’d create an event called something like “Craftinista Girl at Half Mile Handmade Holiday Show.” I don’t recommend this approach because you rely on your own fan base to generate hype about the event. By using the already existing event you will benefit from all of the promoting being done by the show organizers as well as other makers. Collaboration is a beautiful thing! *If you are a creative that has had success with this approach, I would love to hear about it – feel free to email me your thoughts/feedback! On that note after you’re done adding the event to your page, invite some friends! You can do it as easily as sending the invite to your entire friends list or you can spend a bit more time specifically inviting those that you think would actually be interested or live in that area. I have friends all over the place, so I typically do take the time to only invite the people that I think the event would be relevant to. To me, this also makes it seem a bit less like “spam” since you’re only reaching out to those that might truly be interested in attending. Even if someone you invite only says that they’re “interested” this shows up in the feed that is seen by all of their friends, then one of their friends might see it and also mark that they are “interested” in attending, and so on. Sometimes I will look at the number of people that are “attending” and “interested” before I send invites to my people and then check back in a couple days to see how those numbers have changed. It’s surprising to see the impact that you’ve had just by inviting 20-25 of your friends. You can also advertise the Facebook event via Instagram. Sometimes shows will send you a graphic that they created specifically for the event or you can create your own for free using Canva, or the AMB or Word Swag app (I think these are maybe $1 each). On the day(s) that you make your Instagram post about the show change the link in your bio to go directly to the Facebook event and mention that in your caption. I like to use Bitly to shorten the link to the event. However, some people have told me that when they see a link that looks like spam, they won’t click on it. You’ll just have to feel out what your fans prefer for that. Creating a Bitly link is an extra step, I just like it because of the clean look (and because I like to nerd out on the statistics it gives you); but I can’t say for sure what the impact either way is. I like to use Instagram to filter people to the Facebook event because Facebook with take care of all of the reminders for me. You can certainly continue to post about events on Instagram as often as you’d like leading up to the show, but if someone selects that they’re interested on Facebook, they will get a notification the week of the event automatically – less work for you! Another small way to promote your shows on social media is simply tagging the shows accounts or using their specific hashtag(s). If you post a behind the scenes photo of you making an item for the show, tag them! If you complete a whole pile of something and post a picture of your accomplishment, tag them! If you’ve got the car all packed up and ready to go the morning of the show and put it on social media, tag them! These are subtle reminders to your fans and customers that the show is coming up and serves as a good reminder to come and check it out. Also, by tagging the show they might repost your photo and it just might get you some more followers in the process. Win, win, win! Advertise any sales you might be running at that event - "Headbands $3 each or 2 for $5 this Saturday ONLY"
More than likely you have more than one holiday show during the season too. Another idea is to advertise your upcoming shows in your booth at each show. Sometimes I’ll hand-write or print a schedule of upcoming shows and put it in a cute frame that I have out on my table somewhere. I have had shoppers snap a photo of that list on their phone or even tell me they have plans to attend some of the upcoming shows already. It’s advertising and can sometimes be a conversation starter too! I’ve also seen some makers use postcard sized flyers to put in customers’ bags or to keep out on the table for people to take with the list of upcoming shows. One last way that you can promote your holiday shows for free is to contact local business owners (like me) and straight up ask! Find the brick-and-mortar shops in your area that carry handmade items, support the handmade movement, or are proponents of small business in general and simply ask if they’d be interested in helping promote the show. You might also be able to reach out to places like your Chamber of Commerce or a local tourism office. Maybe you could even approach the place that you work at! Ask them to hang a flyer in their window, put some handouts at the checkout, include the show info in their newsletter, or even see if they will do a shout out on their social media account(s). Try to have as much of the “work” done as possible when you contact/approach businesses. Don’t make them search for the details, provide them with everything they need up front. Send them a graphic, or the direct link to the event rather than making them go out and get the information themselves. If you say you’re going to bring flyers by, follow through with that. The more prepared you are, the more likely they will be willing/interested in helping now and in the future. Throughout the process of advertising your holiday shows please be mindful of anything that the show has specifically asked you to do or not to do. Show organizers have often spent time, money, and many sleepless nights to give their show a branded/cohesive look and feel. They have researched you, your business, and their anticipated customers, they know what they’re doing! Don’t get too carried away with interacting or participating on social media. Don’t go make your own graphic for the show if they have provided you with one. Read emails from them in their entirety. Be respectful and use all of the resources they have worked hard to provide you with! Do you have more successful/free/inexpensive methods for promoting your shows? Do you have an upcoming show you’d like us to share with our customers, fans, and followers? Drop me a line anytime at hello@halfmilehandmade.com, I’d love to hear from you! Now, get back to making – can’t wait to see what you’ll be bringing to your holiday shows this year! Some people make resolutions to get organized at the beginning of the year. Others might participate in spring cleaning to bring that necessary order to their lives. For me, back to school is what gets me to kick it into gear. I don't have children but something about the fall approaching makes me want to get all my ducks in a row after a fun and busy summer season. Today I'm just doing a quick round up of some of my favorite organizational resources as well as showing you some awesome back-to-school products that are available for purchase in our store. It's true, I still use paper planner! I love writing things down and color coding different activities or appointments. I have always used a monthly planner for an overview of my entire month at a glance. However, for the the week to week I use a loose leaf sheet for my "to-do's." One of my favorites is a simplistic free printable from Alice and Lois that allows me enough space to write out my daily tasks. Lists play a huge part in the way that I get things done too! Isn't there something gratifying about writing something down and crossing it off? There are tons of free printables out there for grocery lists, general to do lists, setting goals, chores, budgeting and much more. I'd love to hear about some of your organization regimens - feel free to drop some suggestions/ideas in the comments! 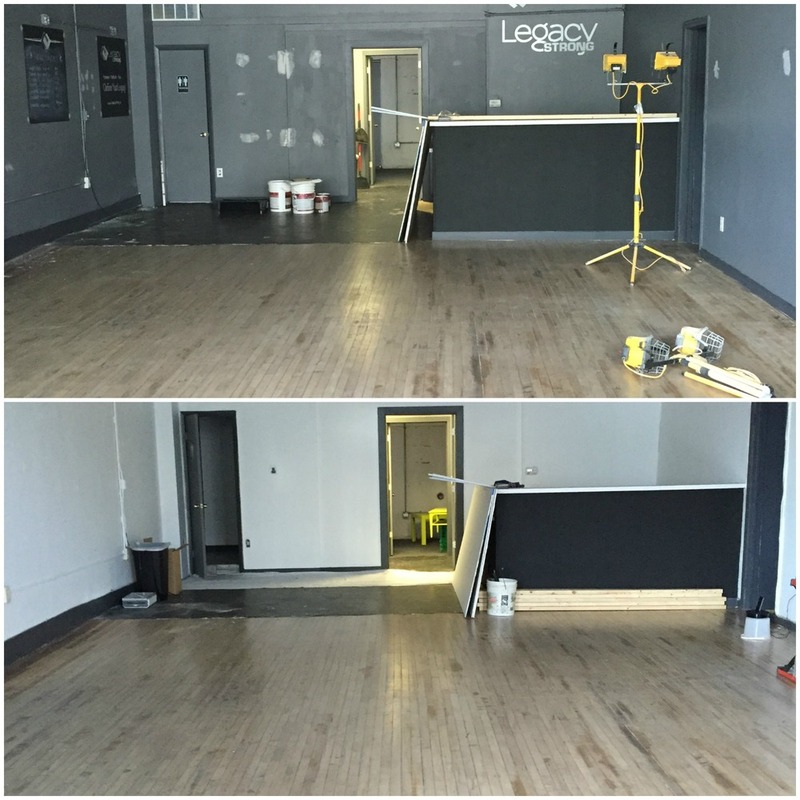 Today we thought we would share some of our transformation photos! You will have to pardon our mess throughout some of the pictures since we thought to grab our camera while the project was happening rather than taking true before and after photos. Legacy Strong makes a couple appearances - they occupied the space immediately before us and still have a studio next door for all of your fitness needs! Prior to that the space was Painterly Pottery who now has a big beautiful location directly across the street from us! (MANY thanks are owed to my family + boyfriend who spent countless hours at the store with me getting it ready to open! The BIGGEST thanks of all goes to me dad for being my 'head contractor' and bringing all of my visions to life! This would not have been possible without them). Front of the store before and after. Check out the tree in both photos - just goes to show how quickly seasons change! Me making the honorary first brushstroke! If I'm being honest, this was pretty much the only painting I did. Painted all of the walls bright white! Custom light fixtures before they went up in the store. Contact us if you're interested in ordering your own! We spent months collecting side tables and coffee tables at rummage sales and thrift stores to make this installment possible. We think it turned out pretty good! This was a completely blank white wall before we put all these different fixtures up. Gallery wall in progress + the messy cash wrap. The back corner of the store all complete! Some of the notable things: the cash wrap covered in pallet wood, the perfect card wall, and the table in the center of the photo. Another shout out is owed to Pinterest! We created a mood board for the store and many of these ideas came from compiling all of those images into one place. Another thing that was a big focus was repurposing as much material as we could. This, of course, allowed us to save some money but also gave the entire store a cohesive look and feel and we are very pleased with the outcome! You will not believe the talent that has helped us fill these shelves and bring the handmade movement to Bay City! We hope you will come see the changes in person and do some handmade shopping with us (if you haven't already)! I am Bay City born & raised and have always had an affinity for this city. This deep affection more than likely comes for the most part from my grandmother who has lived in Bay City all of her life and has continuously been involved in, well, everything it seems! She has always spoke fondly of Bay City and all that is has to offer its residents, and honestly I couldn't agree with her more! One of the first times I can recall feeling a real connection to the city was my junior year in high school; Bay City Central alumni, go wolves! I was in the marketing and management program at BAISD. My grandma was part of the Bay City in Bloom initiative and our class was asked to work on a slogan for them. The chosen slogan was, "Don't be a Litter Critter, CAN Your Litter." Although my idea was not selected, I felt like I had played a giant part in making the city more beautiful somehow; and of course, this tiny image below is the only evidence of it I can find on the world wide web! In 23 years, I managed to live in all three of the tri-cities, worked at a number of local businesses, received degrees from Northwood University and Saginaw Valley State University, and made lifelong friends in the process. My degrees are in business, and I felt it was time to go out on my own in search of a 'career.' Since 2011 I have lived all over the Midwest including Pittsburgh, Indianapolis, and now Columbus. (No, I am not a Buckeye fan, but I have been known to rock some scarlet and grey on Saturdays in the fall). Truth be told, I've always seen myself somehow, some way ending up back in Bay City. Promise you won't laugh, but I have literally fantasized about the day when Brand New and Taking Back Sunday would take the stage at River Roar and I would watch from the balcony at my condo... you know the ones along the railroad tracks near Veterans Park... Can you tell I've put some thought into this? I have enjoyed watching the transformation of downtown Bay City over the past two years. Never in a million years did I think I would make my return this soon, but the world has a funny way of working things out. In my search for a 'career', I ended up getting back in touch with my creative side. I can't remember a time in my life when I haven't been 'crafty' in some capacity - but this was on another level, a serious level. Since the fall of 2012, I have been running my own handmade business, Craftinista Girl, on the side and in the summer of 2015 made it into my full-time job. Throughout the duration of having my business I have learned so much and have met many individuals like me who are making a career (or sometimes a side hustle) out of owning a creative small business. I have observed Ohioans love and pride for their city/state and it is unparalleled to anything I have ever experienced. I appreciate the adoration that they have for their home and share the same sentiments, except mine are about my state, my city, my home. When I would come to Bay City to visit, I'd search for something I could wear proudly or display in my home that would tell people where I'm from, but had little luck finding what I was looking for. (Until I was home at the beginning of May and got this at Ferne Boutique *insert applause emoji*) I think the overwhelming Ohio love gets me feeling homesick every once in a while. A big reason I came to Columbus is the plethora-of-handmade-goodness that is going on here. The maker movement is so electric, so alive, and I am over the moon about all of it. People are so talented and I want to tell the world about each and every one of them! In addition to providing the area with a handmade shopping experience, I am also excited to meet and work with other makers like me! There is an incredible amount of talent both discovered and undiscovered out there. If I can help just one person in their creative journey, even in the smallest way, I will feel so accomplished! I believe in collaboration and hope to foster a community where we can all help one another to grow and thrive. Half Mile Handmade will provide the tri-cities with a glimpse into the world of handmade as a whole. We will carry all types of products that have been crafted with care and love. I hope to help small businesses gain exposure in a new market, and will do anything I can to assist them in their creative endeavors! It may have taken five years but I just may have finally found what I was born to do. I'm absolutely thrilled to bring my passion for all the handmade things to my hometown of Bay City, Michigan!